The first visualizations of Faulkner's Yoknapatawpha fictions were the illustrations drawn to accompany the publication of his short stories in magazines like The Saturday Evening Post, Scribner's and Collier's, the large circulation periodicals that Faulkner regularly submitted work to in his quest for income. 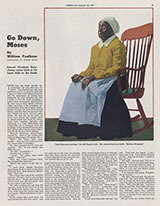 Although Faulkner occasionally worked directly with the magazines' editors to revise a story, there is no evidence that he had any control over - or even interest in - the way these magazines illustrated his texts. The illustrations can, however, help us appreciate the way Faulkner's world, and the people of different races and classes who inhabit it, appeared to his original readers. George Howe's impressive full-color representation of Mollie Beauchamp below is the only illustration that accompanied Collier's publication of this story.